Acceptance and commitment therapy (ACT) has received significant research attention over the past decade and also been used frequently to treat individuals presenting with a variety of clinical concerns ranging from chronic pain and diabetes management to severe depression and substance abuse. 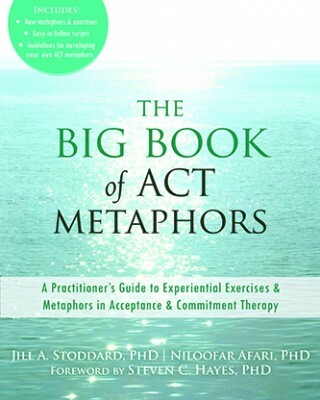 In The Big Book of ACT Metaphors: A Practitioner’s Guide to Experiential Exercises and Metaphors in Acceptance and Commitment Therapy, Jill A. Stoddard and Niloofar Afari provide a comprehensive A–Z resource guide for practitioners, trainees and others in the counseling profession to use when working with clients. Additionally, novel metaphors, new experiential exercises and detailed scripts were collected from the entire ACT community to make this a collaborative endeavor and to provide a “one-stop” shop for all. The book includes nine chapters and 202 pages of material, as well as 10 appendices, additional resources and a complete list of references. The first two chapters provide a brief introduction to Relational Frame Theory (RFT) and specifically explain how ACT is rooted and theoretically grounded in this model. The reader learns about the six core therapeutic processes and the ACT hexaflex. The authors also adequately discuss the function of metaphors, how to create therapeutic metaphors and how to effectively deliver tailored metaphors in treatment. Chapters 3 through 8 provide a more in-depth description of each of the six core ACT processes. Chapter 3 covers acceptance and willingness while chapter 8 focuses on committed action. The other core processes include cognitive defusion, present-moment awareness, self-as-context and values. In each of these chapters, the authors summarize the core process and provide brilliant exercises, metaphors and scripts for the reader, specifically showing how this theory and approach can be translated into practice. The final chapter ties it all together by summarizing and reviewing material from the first eight chapters and also by using a sailing boat metaphor to demonstrate how multiple core processes can occur in counseling. The authors address general guidelines for tailoring metaphors and common stumbling blocks. While numerous ACT textbooks and workbooks are available, this book is essential for any current or future ACT practitioner. In addition to including over 100 metaphors and exercises, Stoddard and Afari have beautifully organized the content in this book and matched each exercise or metaphor with its respective core process (e.g., values, committed action). The authors go above and beyond to cite the source from which the material was collected and even provide specific page numbers in order to assist the reader in obtaining previously published material. The inclusion of material that can be used for both group counseling and individual sessions represents a strength of the book. Each chapter is concise, easy to read and detailed enough for even the most novice counselor to replicate in session. In addition to the book’s numerous strengths, the authors may consider adding a chapter in future editions on the role of culture and incorporating additional multicultural metaphors and exercises to utilize in practice, ultimately fostering more cultural dialogue and a stronger therapeutic alliance with clients engaging in treatment. In summary, this practical, useful and relevant book provides an excellent foundation and guide for new clinicians and also a one-stop shop for well-seasoned ACT counselors. Whether as a trainee, clinician, researcher, supervisor or professor, there is something in this book that you can benefit from and can add to your current toolbox. Reviewed by: Mary-Catherine McClain, The University of Georgia, Athens, GA.
Stoddard, J., & Afari, N. (2014). The big book of ACT metaphors: A practitioner’s guide to experiential exercises & metaphors in acceptance & commitment therapy. Oakland, CA: New Harbinger. ← Video Review – Multicultural Competence in Counseling & Psychotherapy with Derald Wing Sue, Ph.D.